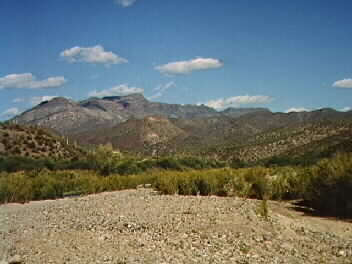 This is a photo of Aravaipa Canyon in the vicinity of the horrific Camp Grant Massacre of 30 April 1871. I am reluctant to place a photo of the actual massacre site on this web page, as it seems to me that is a matter for the San Carlos Apache people to decide. The site is quite unknown to most people, even Arizona historians, and I know some San Carlos Apaches want to keep it that way. I wish to respect their wishes; nevertheless, the story SHOULD be told, and an illustration of some type should help tell the story. Truly, this massacre was one of the worst in not only Arizona's history, but in our nation's history. The murder of approximately 150 innocent Apaches--mostly women and children--is nothing to be proud of. To read more about this masssacre see Camp Grant Massacre story.